Grand-prix Final is coming soon and three American ice dance teams will skate in Barcelona. I think it’s a huge sucess for US ice dance! It’s interesting not only how they will place comparably to other competitors but also interesting how they will place comparably to each other. Something tells me that the fight for the national team starts earlier than at the US National Championships. Madison Hubbell – Zachary Donohue surprisingly got in to the Final, mostly, due to the great short dance and decision the ISU made about the TEB results. I don’t think they can hope for a high place at Grand-prix final, but getting into it is still a great achievement in their career. It also can be a bit of a help before the Nationals because I wouldn’t forget about Hawayek – Baker. Yes, they didn’t show some impressive results during grand-prix but they had some health issues (food poisoning if I do remember correctly) but they can be well prepared for the National Championship. So, what is the best strategy for Hubbell and Donohue? I think they need to skate the short dance as good as they can and try to get as many points as possible to have a gap before the free. Because the free dance won’t allow them to improve their placement after the SD, actually it’ll be difficult even to hold it. While the short dance is one of the best waltzes of the season, the free dance holds them back because it’s not of the high-class. Anna Karenina beat it easily at NHK, and other finalists have a pretty solid dances too. I would also think about a dress change for Madison, she needs at least a high-class look. Grand-prix Final is a good chance for Maia and Alex Shibutani to claim for the title of US No.1 duo even before the National Championship. Can they do it? Yes, they can. They need to place higher than Chock – Bates and it doesn’t seem so impossible. Chock and Bates had a rough start of the season with all those SD changes, they have some technical issues and it seems the free dance itself doesn’t impress the judges a lot. So, Maia and Alex have all chances to show what they are capable of. They have strong (not the masterpiece but still solid) short dance and a really good free dance. This free dance gives them the opportunity not only to keep their place after the short but even to improve it. And it’s stratigiclly wise, because the free dance gives your more possibilities to win back the difference with your competitors. I don’t want to jinx…..but Shibutani have not only a chances to beat Chock and Bates but also have a chance to win the Grand-prix Final. Madison Chock and Evan Bates got into not very pleasant situation. I think they wanted the gold of the home World Championships so badly and they understood that they could win it….and when you want something so badly mistakes happens. This leapfrog around the short dance. Now they have a nice dance that suits them….but the ice dance is a very subjective sport where everything matters. In their free dance I feel some French note)). Obviously they wanted to repeat the Papadakis and Cizeron’s way and to make a modern interpritation of the famous classical piece. But it doesn’t look impressive….and it can be a problem. All the finalists have almost the same base value (the same levels of elements), everything depends on GOE’s and components scores. That means you can’t afford an unsuccessful dance at this level of competition. Madison and Evan had some time to think how to improve, so, maybe nothing is lost for them. But I won’t bet on their win in Barcelona. The Grand-prix Final will be very exсiting in ice dance! 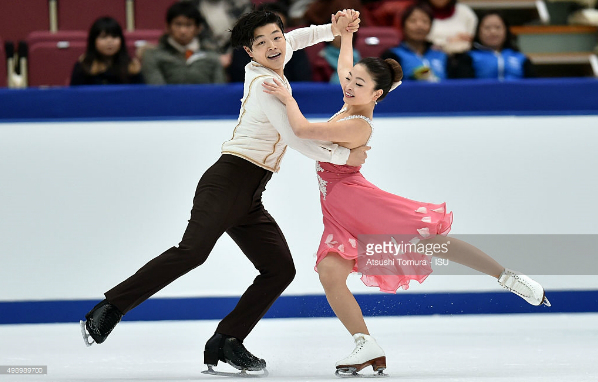 You can also read my review on the Bobrova and Soloviev’s performances at NHK Trophy 2015.